A correction in commodity stocks hurt the FTSE100 yesterday, as they are heavily weighted on the benchmark. The UK benchmark sold heavily under-performing European peers. Although we did manage to close above 7600 yesterday, the futures this morning are pointing towards a lower open. Today investors will be waiting for the latest UK wage and unemployment data due at 12:30pm (UTC+4). The unemployment rate is expected to be steady at 4.2%. 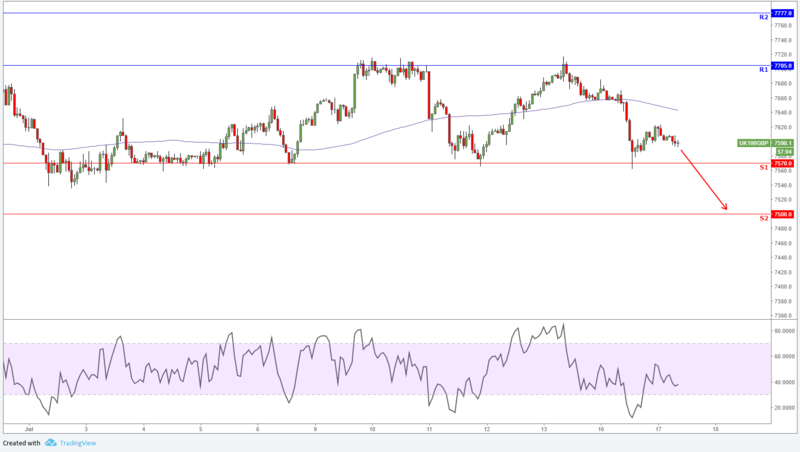 From a technical perspective on a 1-hour chart, the index looks bearish threatening to break the 7570. A close below this support level will drive the UK index lower towards the 7500's zone.